GOOGLE THE TECH GIANT IS COMING WITH THE NEW FEATURE!!!!!! Google has now introduced another India-first feature in Google Maps for Android that will allow commuters in Delhi to see auto rickshaws under the “public transport” mode in Maps. Google has already added a host of new features to Google Maps targeted at Indian users such as ‘two-wheeler mode‘ and ‘plus codes‘, with many others. 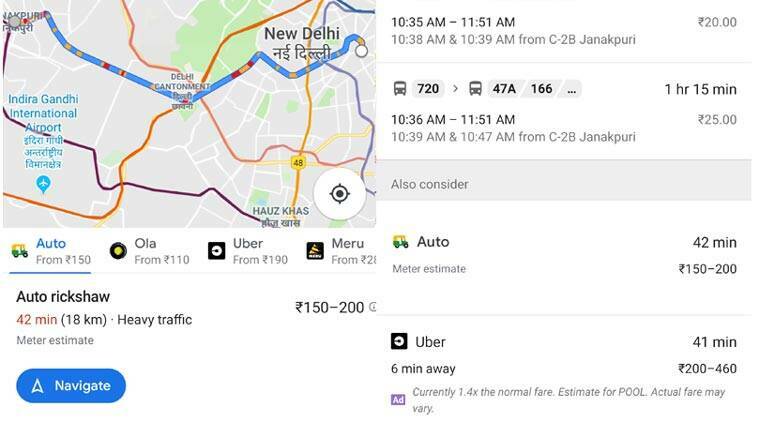 Google said in a statement the new feature can be found within the “public transport” and “cab” modes in Google Maps and is based on the expected trip route and the official fare model shared by the Delhi Traffic Police. Google, however, did not reveal whether the feature, currently available in Google Maps app for Android devices, will be rolled out to other cities in the near future. To use the feature, update Google Maps to the latest version. 2) Search for the destination. 3) Tap on the directions and go to the public transport tab".